Exclusive outdoor event at the Sydney Opera House Forecourt confirmed for Thursday, February 3, 2011. Two previously announced Sydney Opera House Concert Hall shows sell out in minutes. Live Nation is pleased to announce that the two scheduled performances at the Sydney Opera House Concert Hall on Sting's critically acclaimed Symphonicity world tour sold out within minutes! Due to overwhelming demand, an exclusive outdoor show at the Sydney Opera House Forecourt on Thursday, 3rd February has now been added. Tickets will go on presale to Fan Club members at noon (local time) on Monday 25 October with legacy Fan Club members enjoying a one hour advance window at the start and presales then opening to all members at 1pm (local time). Tickets will go on general sale from 9am (local) on Thursday 28 October. Following sold-out performances throughout North America and Europe, Symphonicity finds Sting performing his greatest hits, re-imagined for symphonic arrangement, conducted by Maestro Steven Mercurio (Pavarotti, Bocelli). For this portion of the tour, Symphonicity will feature the Melbourne Symphony Orchestra in Perth, Barossa Valley and Melbourne, the Sydney Symphony in Sydney, Brisbane and Hunter Valley, with the New Zealand Symphony Orchestra performing in Christchurch and Napier, NZ. Selections, created especially for this tour, will include fan-favourites such as The Police hits 'Every Little Thing She Does Is Magic', 'Roxanne', 'Next To You' and 'Every Breath You Take', to notable songs from Sting's enduring solo career - 'Englishman In New York,' 'Fragile,' 'Russians,' 'If I Ever Lose My Faith In You,' 'Fields Of Gold,' and 'Desert Rose'. 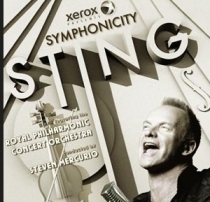 To accompany Sting's celebrated world tour, Deutsche Grammophon/CherryTree Records, recently announced a live CD/DVD package, Live in Berlin, featuring the Royal Philharmonic Concert Orchestra, conducted by Steven Mercurio, available internationally on November 26, 2010. This exclusive collection features previously unreleased material and many of his greatest hits, such as 'Roxanne,' 'Every Little Thing She Does Is Magic,' 'King Of Pain,' 'Fields Of Gold,' and more, all re-imagined for symphonic arrangement. Featuring special guest Branford Marsalis on select tracks, this live concert experience is quintessential Symphonicity! Prior to starting his solo career, Sting was the principal songwriter, lead singer and bassist of the rock band The Police. As a solo musician and member of The Police, Sting has received 16 Grammy Awards, two Brits, a Golden Globe, an Emmy, three Oscar nominations, Billboard Magazine's Century Award, and MusiCares 2004 Person of the Year. He is also a member of both the Rock and Roll Hall of Fame and the Songwriters Hall of Fame. The world tour is promoted by Live Nation and produced by RZO Entertainment, Inc. in association with Universal Music Classical Management & Productions. If you are attending the Sting dates in Madrid or Barcelona later this month then you are you might be interested to know that Dominic Miller is taking the opportunity play a couple of dates at Luz de Gas in Barcelona (28 Oct) and Sala Clamores in Madrid (31 Oct).